A quick view of the most influential metrics in Westport. Westport, Connecticut is a medium sized coastal town of colonial origins in Fairfield County. It has approximately eight neighborhoods, is located along Long Island Sound and is 42nd largest community in the state. The town is nautical in nature with a rich maritime history, gorgeous seaside scenery and an abundance of water and beach related activities. Westport is bordered by the towns of Norwalk, Weston, Wilton, and Fairfield, as well as Long Island Sound. Westport is a sister city with three cities around the globe, Marigny, France; St. Petersburg, Russia and Yangzhou, in the People's Republic of China. Commuting is a way of life in Westport and public transportation is available, an average commute for residents of Westport is just under 35 minutes. Before European settlers arrived, the area was inhabited by the native Pequot tribes. Settlement of the area began with the five "Bankside Farmers." The five families grew and intermingled and expanded into the first community. This community had its own civil and religious components which enabled it to act as an independent community. In 1693, it was known as Bankside, but it was officially named Green's Farm in 1732. Then, in 1835, it was officially incorporated as Westport. In its early days, agriculture was the main industry, however, the town soon became a shipping center. In approximately 1910, the community experienced great cultural development as musicians, artists, authors and more moved to Westport. This cultural expansion is the basis of the communities position as an arts center. During the 1950s, 60s and 70s, many baby boomers relocated to Westport and the community transformed into a thriving suburban town. The city spans 33.3 square miles, 20 square miles of land area and 13.3 square miles of water area. The population in 2010 was 26,391 and the population density was 790 people per square mile. In 2013, the estimated per capita income was $ 91,990 and the estimated median house or condo value was $973,387. In the same year, the mean housing price on all units was $640,338 and the median gross rent was $1,797. The city is decidedly white collar, with over 95% of workers holding white-collar positions. Over 14% of the workforce works from home in small businesses and via telecommuting. The town has a wonderful school system, low crime rates, historic buildings and districts and so much more. Public education in the Westport is provided by the Westport School District, which is made up of nine wonderful schools. The town has two scientific establishments, the Rolnick Observatory and Earthplace, The Nature Discovery Center. 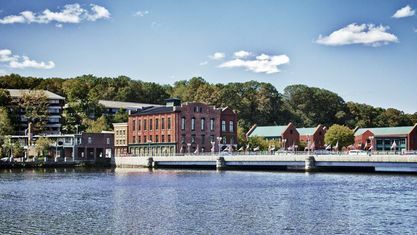 Structures on the National Register of Historic Places include, but are not limited to Green's Farm School, Godillot Place and the Saugatuck River Bridge. It is also home to Sherwood Island State Park, Compo Beach and Burying Hill Beach. Homes for sale in Westport range from first time buyer sized homes up through sprawling family homes. Other real estate options include rental properties such as duplexes, apartments and houses as well as townhomes and condominiums for lease. Contact House Real Estate CT at 203-667-7416 today for assistance in finding the home of your dreams. View our selection of available properties in the Westport area. Check out the latest demographic information available for Westport. Get to know Westport better with our featured images and videos. Browse through the top rated businesses in the most popular categories Westport has to offer.